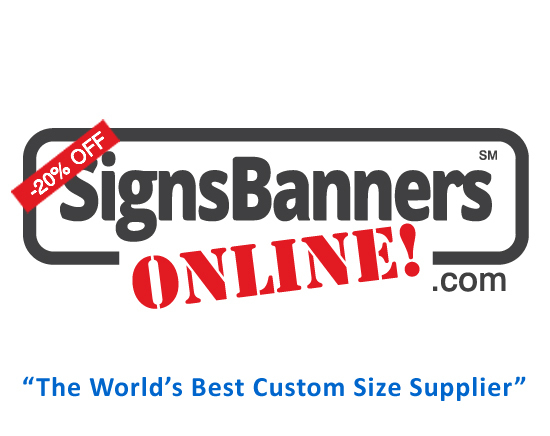 "I recommend to all re-sellers they try the quality that Signs Banners Online has. Once you upload, you have full control... It's Easy!" Direct inkjet printing eliminates the use of paper and enables printing directly onto specially coated fabrics. No post treatment is necessary and the inks are 'finger' dry so some special handling is needed. When coatings are applied it allows for higher resolution digital imaging on various textiles substrates. They may scratch if used on un-treated and treated pvc similarly. Two different ink technologies exist for direct inkjet printing: Dye/Pigment - based inks and Solvent - based inks. Dye - based and pigment - based ink systems are aqueous, meaning they are water - based. They are best for indoor use and need to be laminated if outdoor use is required. Solvent - base inks have the ability to dissolve, suspend or extract other materials without causing a chemical change to the material or solvent. Therefore, these inks offer excellent durability and are commonly used for 'promotional' outdoors use. In other words, the color is beautiful and sublimation techniques are better and do not scratch. This method allows direct printing on media without special coating on top of fabrics . Therefore it creates advantages both in turnaround time and cut back on human error and cost of media. Today, the roll -to-roll technology is accessible , which makes textiles even more attractive for UV printing. Currently, textiles are available up to 3.2meters. The Newest print technology is direct printing using Latex inks. This method eliminates the tradeoffs between solvent and water - based inks. A few of the many benefits includes: situational outdoor use , lower costs with the use of uncoated media, odorless prints, lower fluid maintenance and environmental benefits such as non VOC ventilation needed and the use of non combustible inks. Direct printing gets rid of the transfer process, no extra machinery or transfer paper is necessary, saving both time and money. The product life is shorter and inks may detoriate. Dye Sublimation Printing is a method for imaging fabric with dispersed dye. The design is transferred from preprinted paper onto the fabric by contact heat, which causes the dye to sublime. Having no affinity for paper, the dyes are taken up by the fabric. The dyes origin is solid-gas-solid again offering full penetration of the yarn offering full color profile. In other words a better color that is deep, bright and more 'life like'. This method produces a reasonable stable quality ofprint. Images are well-defined, colors pop and detail is exact. Sublimated image results are washable and scratch resistant because the image is contained 'within' the yarn. In this method of printing, the image can be cured in the fabric as it exits the printer station. Additionally this would eliminate the need for a transfer print machine to set the inks in place and also the need for transfer paper. This is S B O's preferred printing machine situation and colors are realistic and offer the highest vibrancy with highest resolution capture for fabric (both natural fibre's and synthetics) so a graphic designer achieves excellent design vs. output results using a CMYK based profile system. One other advantage worth noting here is that the penetration of the color to the back side of fabrics, particularly in light and medium weight fabrics are superior to the traditional transfer method. As in most other methods of digital printing, these fabrics are suitable for both indoor and outdoor applications. Disperse dye inks are ideal for fabric signage and banners. S B O lead the way with their factory to you Duracoestatic system. Duracoestatic printing is a technique we employ that marries all elements of printing, material, resolution, color profiling and fitting to create stunning results un-rivalled by other combined systems. Duracoestatic printing provides the best quality. S B O offer both techniques for fabric products and vinyl pvc direct to vinyl too. Their online service is fast becoming the most popular for the graphic printing industry and is used my hundreds of wholesale resellers of completed finished print goods everywhere. Using the newest technology to match all systems with perfect unison, Duracoestatic Printing leads the way for large scale full size full color banner printing and finishing. A few of the many benefits includes: image sharpness, huge custom sizes, speed, quality and ease of management for online ordering. Low costs with the use of specialized media, economic prints, low maintenance and environmental benefits such as recycling 95% of each system including Non VOC inks. Duracoestatic Printing also means accessing the latest factory equipment and gets rid of the lag time, no lost proceedures or transfer paper is necessary, saving both time and money. The product life is long and inks will not scratch. It marries all components into a perfect supply system designed for wholesalers and resellers. When you order you know your product is coming directly from the factory. Lowest price. Highest Quality. Fast. 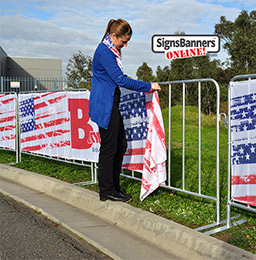 Signs Banners Online gets rid of the delay process, gives control to the designer, saves time and money and gives the customer total management opportunity. The products are printed using new machinery and are fast. It marries all components into a perfect supply system designed for wholesalers and resellers. "Signs Banners Online is an online service that designers use to access the factory direct... it's made by designers for designers!". The ink droplets are larger. Duracoestatic printing is a technique we employ that marries all elements of manufacturing banners and sign displays into a successful outcome. To do this, we start by using 'native' or 'raw' META COLOR DATA information contained inside the file. E.g. Native 72 dpi is created at the full order size of the banner sign. Creating a full order size banner sign will require millions of pixels, so we keep the MAJOR BASE PIXELS and set the 'print dpi' at the printing machine. It is equivalent to Photoshop increasing dpi AND keeping the raw data intact. At the printhead, software converts each 'pixel' to a higher resolution matched to the ink droplet size giving you longer lasting, more vibrant and outdoor graded signage results. You will not see any lesser quality, indeed, this technique improves the visual results for big work. Duracoestatic Printing Technique is designed for several fabric and textile printing applications such as: POP signage, trade show graphics, museum fine art prints, banners, flags, fabrics for custom clothing, fabrics for interior design and much more. It operates with equal ease and quality whether it is printing pigment on polyester fabrics or dye-sublimation inks on to dye-sublimation transfer paper. The Duracoestatic Printing Technique employs 2 heads (180 nozzles x 8 lines) for true 1440dpi output resolution at high print speeds. 8 channel piezo print head technology helps make the images stand out and look sharp to even the most discerning viewers. Customers can enjoy the flexibility of being able to print from either our bulk DuraPrint-DS1 ink system. And with the dual head set up, Duracoestatic Printing Technique and DuraCURVE WAVE & SPIRAL droplet technology top quality Printhead results ensure. Large billboard filesizes become very big very fast, learn how to use 72 dpi and you'll soon see better results gained by the knowledge of RAW format pixel control. Raw data is contained in 'Color Data Blocks' and is sequenced and processed via servers and software to show the imagery you see on your monitor or device. Based on numerical formatting the base calculations are sequenced to printable data via a RIP server. You will be able to design faster and achieve better results. Supplying 1gb files are old tech. We look at the base elements and this is why you can supply lower res files drawn to 1:1 size. The 1:1 size of your original file is the engine powerhouse and will result in more color data blocks at conversion vs. increasing non-raw-data eg: higher resolution. Each color block builds on another to make a higher resolution at the printhead. Change what you know: Designers have traditionally learnt that higher resolution = higher quality. This is only valid for plate/film based printing such as LITHO, Offset etc. Modern digital printing machines with RIP technology do not work with such theories. With our new 'Duracoestatic' technology we look right into each color data block. Uploading a file created at full size set to 72 dpi will be the best result. The greatest difference between digital printing and traditional methods such as lithography, flexography, gravure, or letterpress is that there is no need set art printing plates in digital printing. At the printhead, software converts each color data block into a higher resolution. My business cards supplier demands 150+dpi... why? If they are digital printers... they dont need it. If they are plate/film printers they could update their techniques. Using your favorite graphics program, use the Zoom tool to inspect 'print size' or 'actual pixels'. If you've created a 1:1 size, this will indicate your native color data blocks on screen. "Such a great way to get things done... a big thanks to everyone who set up this site"
1: Also see the best way to create the outer edge 'fold over bleed' and material over size using the artwork sector.